Because of a recent study, we now know that Chinese censors aim at stopping collective action, regardless of content, rather than limiting political speech per se. What are the implications for Chinese activists? Ai Weiwei has already adopted the strategy of dilemma collective action. In the new documentary Ai Weiwei: Never Sorry, hecarries out two of them. First, he uses Twitter to invite supporters in Chengdu to eat local pig trotter soup with him at a simple restaurant with sidewalk seating. The act of eating the broth, a local specialty, is normal. The act of eating at a sidewalk restaurant is normal. What makes it political is that is a collective action organized by Ai Weiwei (again, regardless of content). In the documentary the police politely ask him when he will be finished instead of dragging him away. To do so would have make them look like thugs. As it is, they merely look ridiculous. 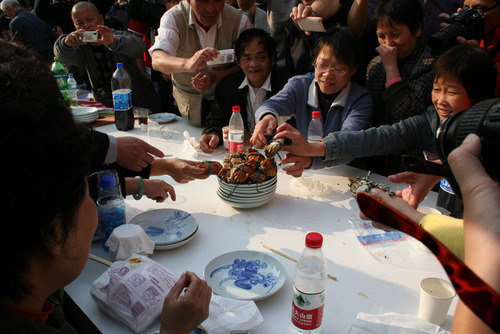 In a similar dilemma action, when Weiwei hears his Shanghai studio will be torn down he decides to have a celebration instead of a protest and invites supporters to come dine on “river crab” in the studio courtyard before the demolition. While river crab has associations with anti-censorship activism, the event itself is a joyous and goofy picnic. Wei himself does not attend, but his supports take and share digital photos of the event. Again, if the government broke up a picnic, they would look repressive and ridiculous. Social media enhances the impact of dilemma collective action by giving it a greater audience. The meal in Chengduwas recorded by Weiwei’s team as a self-released Chinese-language documentary calledLao MaTi Hua(the name of the soup), it was live-tweeted by Weiwei as it occurred, and it is also in the documentary made for anglophone audiences which I saw. While Weiwei did not attend the river crab banquet, his supporters created and shared their own images, which was encouraged. Because dilemma actions often involve humor, which decrease fear, and thus increase participation, they are also a sneaky way of creating more political activists. By revealing through their online censorship practice that they seek tohaltcollective action, the Chinese government has also revealed avulnerabilityto the kinds of dilemma collective actions Weiwei is carrying out. If they intervene they look despotic. If not, they appear foolish and impotent. Either is a win for Chinese activists.